I have always dreamt of visiting Istanbul. There is something about the city that makes it so very alluring. Perhaps, it is the rich history that runs through its very foundations, it might be the infusion of Asian and European influence or it could be the treasures that can be found within its streets from tantalising Turkish delight to deep sensual scents from a candle burning. It is from these steams that Chelsie and I would like to introduce to you a brand that we have recently discovered and hold in high esteem: Lokum Istanbul. Lokum Istanbul specializes in the highest quality products that draw intimate inspiration from Turkish culture. 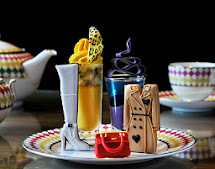 Lokum Istanbul strives with flawless execution to bring back the delights, flavours, knowledge and beauty of the bygone Ottomoan-Turkish culture through gifts and treats that also incorporate the present day influence through their own uniquely blended interpretation. Chelsie and I were excited to discover that Lokum Istanbul has recently opened their first London based store, on Walton Street. 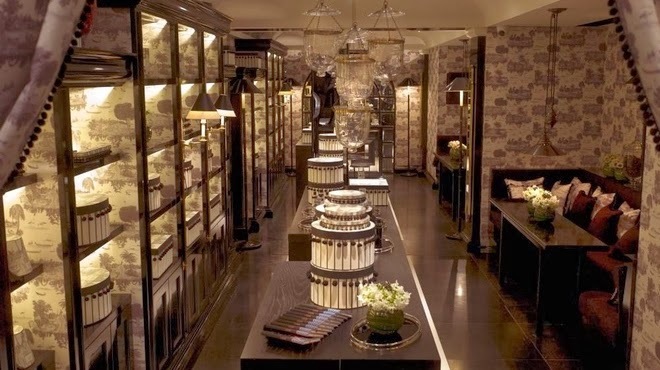 This store was designed by Anouska Hempel and is modeled on their popular Istanbul store with moody lighting, sparkling chandeliers and wallpaper decorated in stunning Ottoman toile de Joury. Which ensures that guests in London are able to experience an authentic experience of Turkey from the moment they step through the doors. 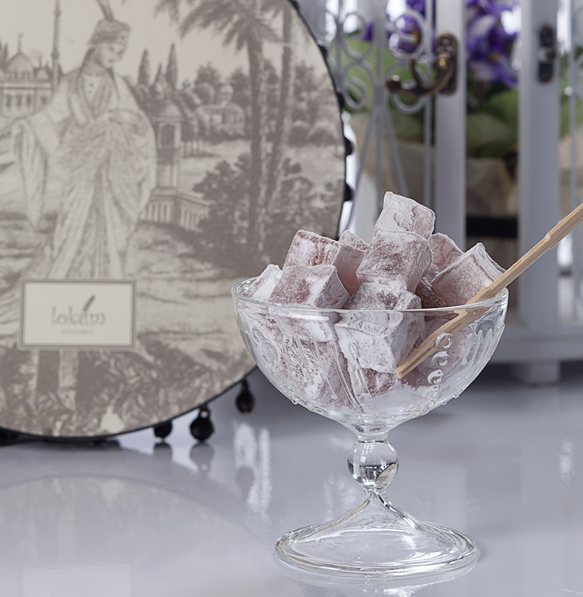 Lokum Instanbul's range includes handmade Turkish delight (that we simply could not resist trying! ), fragrances, candles, books, cigarillo boxes and beautiful gift boxes to complete the look for that perfect find. The allurement and curiosity behind Lokum Istanbul's products understandably left us eager to to try some for ourselves. On this occasion we were lucky enough to try some of Lokum Istanbul's tantalizing handmade Turkish delight. To buy a product from Lokum Istanbul, is undeniably an experience within itself. Our Turkish delight was presented to us in a large, beautifully decorated round box with fezzes's dangling down it's sides. Chelsie and I were immediately impressed with the care and effort that had gone into ensuring the aesthetics of our product were embodying the spirit of Istanbul from the onset. Once we had removed the lid, we discovered our Turkish delight was elegantly wrapped in light tissue with good quality wooden sticks ready for our consumption. In our experience inside our box we were provided with a detailed overview around the history of Turkish delight, whilst helped to ensure we would also be soaking up some of the treats extensive history with each piece. An example of this history included that during the Ottoman era Turkish delight was considered an integral part of the palace cuisine. Our box of Turkish delights contained a generous selection of truly stunning treats. The Turkish delights tasted sensational, they were rich, flavorsome and left us quite literally fighting for the last one! From each bite it was evident to us, the level of care, carefully sourced components and passion behind each treat. We would highly recommend a box of Turkish delight from Lokum Istanbul for a variety of occasions ranging from birthday presents, housewarming presents, for loved ones and of course following our example for pure indulgence at its finest. We will certainly be returning back to Lokum Istanbul for another box, or two!